Today we're starting another new series on Jewish Humor Central called Funniest Jewish Film Moments. Over the years there have been many films on Jewish themes, and it's only natural to expect Yiddishisms and overt references to be include in them. But what really tickles us is to find a covert reference in an otherwise non-Jewish film that was put in by the Jewish director just for fun or to wink at "Members of the Tribe" who will get an extra kick out of the private joke that they share. 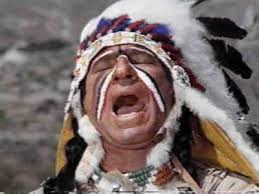 Speaking of members of the tribe, the first film clip in this series, which will run sporadically, is the classic Indian (they weren't know as native Americans then) scene that Mel Brooks directed and acted in when he played the Indian chief in Blazing Saddles. In this scene, Cleavon Little tells Gene Wilder how he came to be Sheriff in this Western town. He came as a little boy with his parents in a wagon train that was intercepted by the entire Sioux nation. When Indian chief Mel Brooks gets a good look at the occupants of the wagon, he lets loose a hilarious stream of Yiddish. Blacks! No, no, don't be crazy. As long as you're healthy. Have you seen such a thing in your lifetime?